In celebration of National Space Day, the Museum invites you to join us on May 4, 2019, featuring a Smithsonian speaker and Jedi Training Classes. 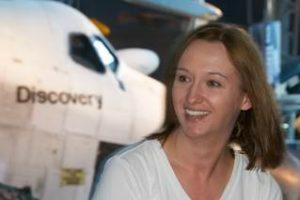 At 10:00 a.m. Dr. Jennifer Levasseur from the Smithsonian’s National Air and Space Museum, will present on the topic of space imagery and how space photography technology has changed throughout the years. Dr. Levasseur is the responsible curator for the National Air and Space Museum’s astronaut cameras, Skylab program, and astronaut personal equipment (pre-shuttle) collections. The Museum will also hold Jedi training classes presented by Husker Saber Academy for youth ages 6 and up from 11 a.m. – 2 p.m. Reservations may be made upon entering the Museum on May 4. Young Jedi’s will master the tricks of the trade, learning the correct stance, how to swing, and how to defend themselves with their Lightsaber. They will master using “The Force” to defeat any enemy in their way. Join Ty Rempe with Ty Makes to view his space themed art (available for sale at the Museum) and take a picture with the space themed backdrop, specially painted and donated to the Museum by Ty for this event.